Welcome to the first Newsletter of the year. It’s a bit late as we’ve not long returned from a visit to New Zealand. Brief travel notes here and links to my weekly posts for those interested. Also in this edition: Australia Post has my military books for the ANZAC Centenary; forthcoming visit to the NSW South Coast; and some back copies of out-of-print books still available. As mentioned, Jill and I are just home from an 18 day visit to New Zealand – and a great time indeed we had. It was mainly holiday, driving from Auckland to the Bay of Islands, down to Wellington, across to Nelson and finishing at Christchurch. And withal it involved a rediscovery of the very welcoming Maori culture, the beauties of Tolkien’s (and Peter’s Jackson’s) “Middle Earth”, and the creative excellence of the World of Wearable Art: WOW! There was some business, of course. We had two days in Hamilton meeting my editor, Suzanne, and her family, and talking over the current book For Love of Country. She’s had the manuscript for a couple of months – and the good news is that Suzanne likes it. There will be some work to do on clarifying the various time shifts, re-shaping sections of dialogue, character and high points in the drama. But essentially the flow and structure of the book worked for her; and as I trust Suzanne’s judgment on these matters, for we’ve worked together often before, I don’t anticipate any major difficulties as I prepare the final revised draft for submission to the publisher over the next couple of months. An important outcome from the trip. 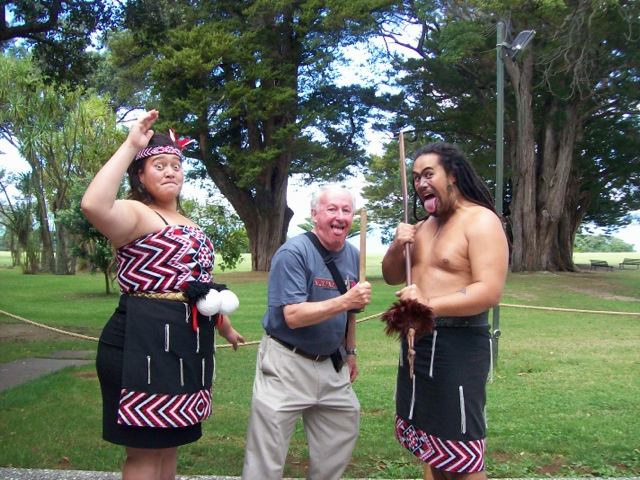 * A Maori welcome ceremony at the Waitangi Treaty Ground on the Bay of Islands, where I played visiting chief, was confronted with the full display of shaking spears, war cries and defiant tongues. No emotion to be displayed, but a little speech of thanks afterwards, presentation of a small gift (a pine baton), and a marvellous display of singing, dancing and dexterity with weapons and poi balls. 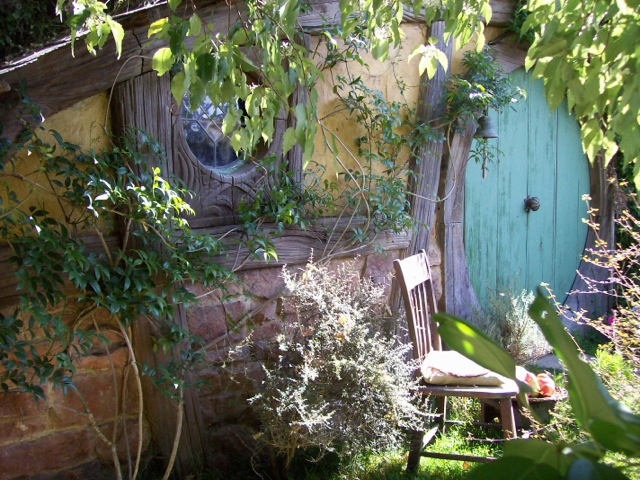 * A visit to the farm outside Matamata, where the village of Hobbiton was created for The Lord of The Rings and The Hobbit series. Now built in permanent materials, it’s the meticulous attention to detail that impresses – and which was a key factor in the artistic success of Jackson’s trilogies. As awesome, in the true sense of the word, were the boiling steam vents outside Taupo, and the volcanoes where darker scenes of this “Middle Earth” were filmed. * Touing the Weta Workshop in Wellington, where many of the sets, costumes and props for the films were made, and a chance meeting with Alan Lee, who with John Howe was a conceptual artist for the films. A rare opportunity to thank him for the pleasure he’s given to millions of people around the world. * Christchurch remains a sad and still quite broken city, even four years after the earthquakes in which over 180 people died. The cathedral is propped up with girders and surrounded by rubble as debate continues on whether to rebuild the old one or create a new and more shock-proof church. Elsewhere, reconstruction is slowly getting underway – and the Re:Start shops, made from bright shipping containers, remain splendid exemples of self-help and renewal. * New Zealand’s annual World of Wearable Art (WOW) exhibitions have become a truly international event where the best of creative costume design and fabrication from materials ranging from textiles to wood, metal, plastics and cork produces some amazing pieces. We saw the Museum in Nelson and also a travelling exhibition at Auckland just before it left for overseas. WOW!! The Anzac Day centenary on 25 April will be a significant day in the life of the nation: 100 years since the Landings at Gallipoli, and all that has happened since then in terms of our military history, sense of national identity, and the immense changes flowing from the Great War that continue to influence the world to this day. In many ways I think that Anzac Day has become Australia’s true national day: not – as some would have it – a mindless glorification of war, but rather a solemn recognition of the tremendous sacrifices that were made individually and collectively, to secure that foundation on which all our liberties are built. It’s been a relatively recent development, and one that has involved the quite unexpected resurgence of support for Anzac Day over the past couple of decades by the rising generation. I’m not sure exactly why. In part it’s to do with the revival of interest in Australia’s past arising from the 1988 Bicentennial; in part to the fact that the Great War diggers have all gone, and the conflict can now be spoken of free of immediate pain. It’s beginning to happen, too, with the generation that fought the Second World War. While I have no military background it’s been a privilege to be associated with this movement in a small way through school visits and other events talking about my military biographical novels. They began in 2001 with Soldier Boy, about the 14-year-old Anzac James Martin, almost certainly the youngest Australian soldier to die in war. During the research I was honoured to meet Roy Longmore, one of the last four surviving Gallipoli soldiers: a member of Jim’s 21st Battalion – as was, I discovered, my Great Uncle. They would have known each other. Truly, the past is never the past. Australia Post.As part of the commemorations, you may have noticed Australia Post has three of my military books for sale at special prices in many Post Offices. 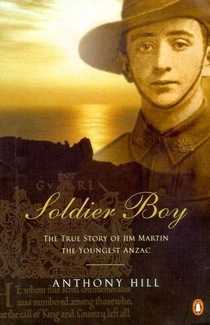 Soldier Boy, Young Digger and The Story of Billy Young have all been ordered. In a note, Australia Post says that it’s keen to present the importance of Anzac Day to both young and old customers. And to that end, it feels I’ve been able to produce a range of books “that deal with this complex issue in an accessible way with beautiful stories.” It’s very nice of them to say so. South Coast.For my own part, I’ll be marking the week by visiting the South Coast of New South Wales, talking about Jim Martin, Young Digger (Honoré Hememe), and the significance of Anzac to school children and older citizens. 21-23 April at Bateman’s Bay, Moruya and Narooma. I can’t think of a better way to commemorate the occasion. I’ve started writing an occasional blog post again, commenting on aspects of a writer’s life, with some emphasis on documenting the process of getting For Love of Country through the press and into the bookshops. It’s the sort of backstage business that some readers like to know about, and useful to make a record of it. The blog site is: https://anthonyhillblog.wordpress.com/and I’d welcome any comments you may wish to make as we go along. I also post the pieces on this site, in the Blog menu on the side bar. · Word Games– the debate on the most effective methods of teaching children to read. · Chapter Notes– the importance for the historical novelist to give sources, background and indications where assumptions have been made. · End Matters– preparing the References and Further Reading section, Acknowledgments, Picture Credits, Chapter Notes and so on. · Auld Acquaintance– discovering in a computer file some circus poems I wrote years ago and had forgotten all about. · Wishing Away Computers– whether we’d be better or worse off if the Internet, word processors and all the paraphernalia of the digital age had never been invented. · The Hardest Cut– the wrench of having to edit out of a manuscript a word or passage of which we are particularly fond. There are still one or two back copies of books now out-of-print available until stocks run out. • Forbidden ($18 plus $2.10 Australian domestic postage). • The Grandfather Clock ($20 plus $3.50 Australian domestic postage). If you are interested in any of these books, please contact me directly at anthony@anthonyhillbooks.com. Payment can be made by PayPal, direct deposit or by credit card. Please ask me for the details.